Preschoolers love to play with play dough. It’s fun, it’s squishy, and it’s an excellent way to learn the alphabet. Have your children roll the play dough into long snakes. Longer and slimmer is better than short and fat. The long skinny snakes are easier to fold into letters. Help your child to create the letters of the alphabet with their play dough. You can even write the entire alphabet together using play dough if your child’s attention will hold. Quite frankly, my kids tend to have shorter attention spans, so we only work on a letter or two at a time. Another great option to writing the entire alphabet is to write short words or your child’s name. 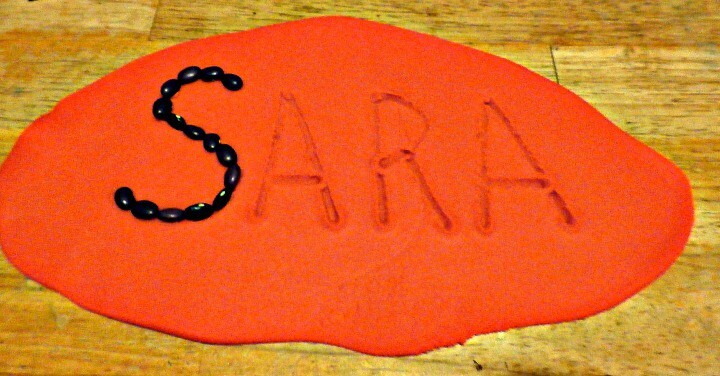 Nothing makes a preschooler happier than to see their name written before them in play dough. Play dough can also be used to draw the alphabet on. First you roll the play dough as flat as you can. Kids love using rolling pins for this. The play dough needs to be smooth rather than thin, so don’t worry if there’s still quite a bit of depth when your child is finished. Now take a stick or a pencil and write a few letters into the play dough. Encourage your child to attempt to make the lines themselves. See how many letters you can write. 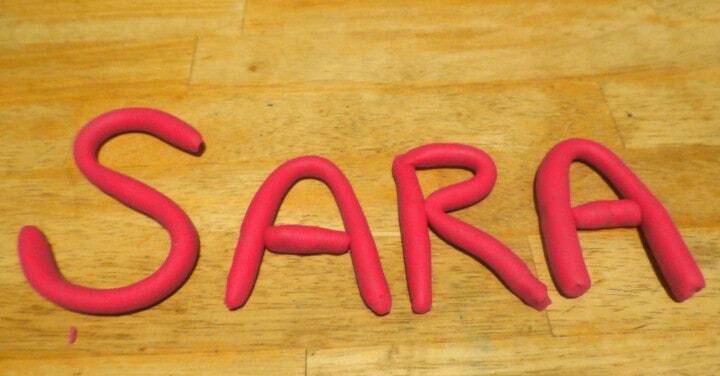 Cut your child’s name into the play dough and encourage your child to trace their name with a finger. If you’re adventurous, your child can use pebbles or beans to trace the letters of their name. Stamping the alphabet is really fun and easy for preschool kids. I prefer to use magnetic letters since they’re stuck to the refrigerator. Again you’ll want to let your child roll the play dough flat. 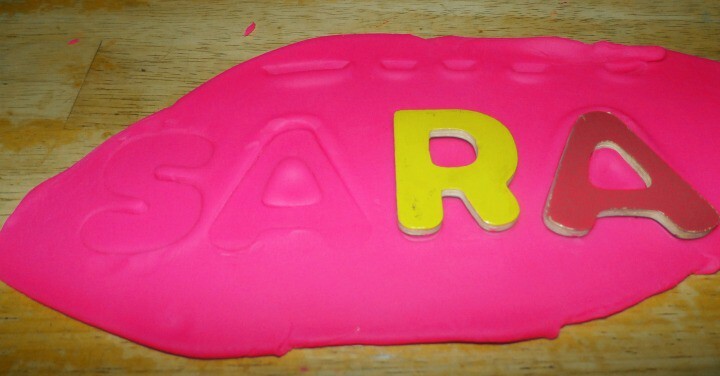 Once your child is satisfied with the smoothness of the play dough, choose a few letters to stamp into the play dough. Be sure to name the letter as you push it in. Encourage your child to trace the letter with a finger. Have fun stamping names and easy words. Try dog, cat, or rat. Encourage your kids to draw a dog, cat, or rat into the play dough beneath the words. 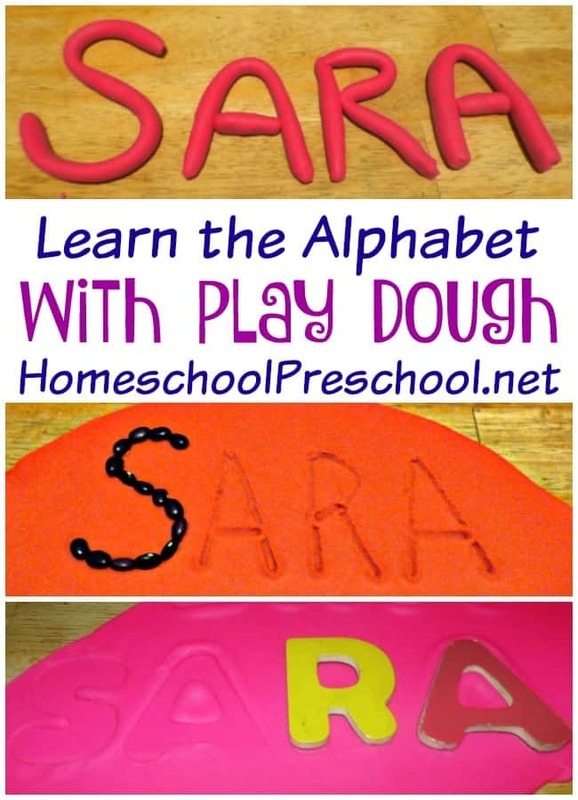 Play dough is a fun and easy way to learn the alphabet with preschoolers. Do your preschoolers learn the alphabet with play dough?